“I love my new Kitchen! Some say that a countertop makes a kitchen . . . It sets the tone and accents a color scheme. But choosing from among today's available selections is challenging. Granite, Marble, Quartz or Soapstone? Formica or Corian? Here's a rundown of options to help you choose. 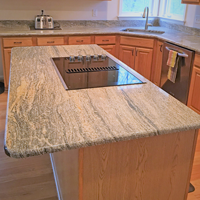 Many people prefer natural materials such as granite. It's easy to see the appeal. Granite has a rich, lustrous look. It's somewhat heat and scratch resistant but like almost all surfaces, it can scratch and chip. The resilience depends on the type and quality of the granite. Some are more porous. All require care but it is quick and easy to apply sealant every year. Choosing granite can be difficult. Sample squares may not show the varying patterns visible on a full slab. We recommend delaying your final selection until you look at a full size slab. Cutting granite requires water-cooled diamond blades. It takes time and skill to cut them which adds to the price. If you require several cutouts for sinks, the price may increase. Edge styles, including straight, beveled and bull-nose, may also affect the price. Plan accordingly. It can take up to 10 days from template to installation. Marble is softer than granite, so it scratches easier. Fortunately, scratches can often be buffed or polished out. Marble also can fracture along veins. Because it's soft and is vulnerable to stains, we don't usually recommend it for kitchen use. Most people choose marble for bathrooms instead of kitchens. Yet, its cool, non-stick surface is ideal for bakers and candy-makers. People renovating Victorian homes may choose marble for an Old World flair. Marble has more feature variations than granite. View large slabs before you finalize your selection. Soapstone is another natural material. There aren't as many color choices as there are with granite. The spectrum runs from muted gray to green. Soapstone looks wonderful in classic or country kitchens. It also looks stunning with a farmer's sink. There are disadvantages. Soapstone does scratch, though like marble, it can undergo buffing. It's highly resistant to heat, but it can stain. Maintenance is a must. Sealants darken soapstone to give it a warmer appearance. Silestone, Cambria, Caesar Stone, Wilsonart and Zodiaq are engineered quartz and are made by blending crushed quartz with pigments and resins. The quartz gives a finish similar to natural granite. Quartz is one of the hardest materials in nature, so it creates a surface that is durable, practical and carefree. Unlike granite, quartz surfaces never need sealing. Quartz products are stronger, more consistent and easier to care for than natural stone. They also come with a warranty. The nonporous surface is easy to clean and it maintains its luster. Corian is a manmade solid surface product made of plastic-resin composites. Being manmade has advantages. A Corian sink can be molded so that there's no seam between it and the countertop. There are no crevices to collect bacteria or grime. Like quartz products, Corian also comes with a guarantee. Corian is also easily repairable and can withstand some heat. However, hot pans, as well as some heat generating appliances, like frying pans or crockpots, can damage the surface. Laminates have come a long way since lemon-yellow countertops. The best known laminates are Formica and WilsonArt. They have a large selection and many patterns that look like granite. Other patterns look like wood metal or stone. Laminate can even mimic fabrics. Beveled and decorative edges add a classier look to laminates. In short, nothing beats laminate when it comes to the wide palette of colors and patterns.